LIKE YOUR CURRENT PHONE AND NUMBER? Keep both and SAVE on your monthly plan fee! Bring Your Own Phone to Zoomer Wireless and GET 10% OFF* your monthly plan fee! PLUS, enjoy the flexibility of no annual contracts. When you start with Zoomer Wireless, the SIM Card is free, the activation fee is waived and no commitment is required. Whether you need a cell phone for emergency, to keep in touch with your loved ones or to browse the internet, there’s a solution for you. Which plan will better suit your needs? Share your minutes, texts and data with your family and save! Use your phone seamlessly in Canada and the U.S. If you have an existing phone number with another provider and would like to have it transferred, no problem. We only need the name of your provider and the related wireless account number to transfer your phone number. Call 1-888-281-2107 to Bring Your Own Phone and start saving! *Some conditions apply, call for details. Offer available to customers who bring in an unlocked phone with new activation of Zoomer Wireless service on any in-market standard plan. Credit of 10% applied each month, before taxes and applies only to monthly service fee of plan. Service term not required. Cannot be combined with other offers. What does unlocking a phone means? If you bought your phone from a different cell phone provider with a contract, there's a great chance that the phone is locked to the provider's network. In order to use your phone with other providers, you have to verify that the phone is compatible with our network and/or to unlock it, which can be done by contacting your previous cell phone provider or by asking a cell phone repair store to unlock the device for you (unlocking fee usually applies in both cases). If you're not sure whether your device is locked or not, give us a call. 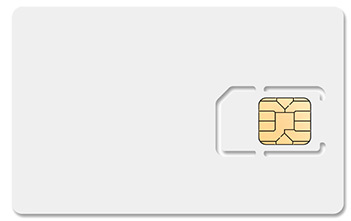 A SIM card, also referred to as a smart card, is necessary for the operation of GSM phones. It stores your service information and can be used to store your phone book entries. The SIM card comes pre-inserted and pre-activated with your new SimplyConnect phone.